Daniel Jerome Kuntz, 79, Rugby died on Monday, April 1, 2019 at the Heart of America Medical Center in Rugby. He was born in Rugby on July 25, 1939 to John and Theresia (Mattern) Kuntz. Daniel went to country school, worked for area farmers in McHenry County in the Smokey Lake and Gorman Township areas and also worked at the Ford dealership in Towner as a mechanic. He married Mardell Marlys Herman at Fulda on May 17, 1963. In 1965 he purchased a farm in Smokey Lake Township and farmed there all his life. They moved to Rugby in 2004, but continued his farming activities. He was a member of Sacred Heart Church in Orrin and later Little Flower Church in Rugby. Daniel will be remembered for his exceptional talents in repairing vehicles and machinery, often making parts that were not available. He also enjoyed hunting and fishing all his life. He is survived by his wife, Mardell and their children, Danae and her husband Kent Hoffman – Minot, Rodney and his wife Lisa – Surrey, and Douglas and his wife Toni – Voltaire. He also leaves two brothers, Engelbert Kuntz - Towner and John Kuntz – Rugby and a sister Bernice Huber - Naples, Florida. Eight grandchildren and 5 great-grandchildren will miss their grandfather, Daniel, very much. He was preceded in death by his parents, and brothers, Lawrence, George, Martin, and Kasper. Funeral services will be held on Tuesday, April 9, 2019 at 11:00 A.M. at Little Flower Catholic Church in Rugby. Visitation will be held on Monday from 3-7 and a prayer service at 7 PM . Visitation will continue on Tuesday from 8 AM to 10:30 AM. There is no reviewal at the church. 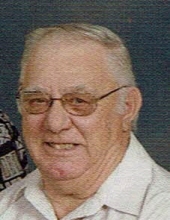 Burial will follow in the St. John Blumenfeld Cemetery – rural Orrin. Kara Flatland, Ricki Hill, Randall, Rhett, and Ryan Hoffman, Daniel T. , Kyle and Rebecca Kuntz will serve as casketbearers for their grandfather. To plant a tree in memory of Daniel Kuntz, please visit our Tribute Store. Prayer service at 7 P.M. . Visitation will continue on Tuesday from 8 AM until 10:30 . There will be no reviewal at the church. "Email Address" would like to share the life celebration of Daniel Kuntz. Click on the "link" to go to share a favorite memory or leave a condolence message for the family.